Everybody’s talking about Marcy—Chicago’s hip new teen TV talk show—and Nancy has tickets to see it live. When host Marcy Robbins grabs the mike and goes on the air there’s sure to be plenty of fast talk and shock-filled fireworks. But the biggest surprise of all is directed straight at Marcy: an anonymous threat on her life! Nancy’s digging up all the dirt, searching for the single obsession powerful enough to incite a passion for murder! "Look, Nancy -- there's the Chicago Media Center!" Keeping a close eye on the Eisenhower Expressway traffic as she drove, Nancy Drew glanced ahead and to the left. Her friend George Fayne was pointing to a distant metal and glass skyscraper thrusting up into the Chicago skyline. "We're so lucky!" George's brown eyes sparkled with excitement. "Here it is an ordinary Monday afternoon, but soon we'll be in the TV audience of 'Marcy!' waving to Bess at home." Bess Marvin was George's cousin, and George's and Nancy's best friend. "Poor Bess," Nancy said. "I know she's brokenhearted about missing this trip." "Bess is the biggest Marcy Robbins fan of all time," George added. "Did you know she used to subscribe to Teen Talk magazine, just to read Marcy's column? "Oh, well." George shook her head ruefully and then shrugged her slender, athletic shoulders. "At least having the flu gives Bess an excuse to watch 'Marcy!' every day." "We'll have to be sure to get Marcy's autograph for Bess," Nancy said, pulling onto the ramp for the JFK Expressway. She turned the air conditioner up to high. It was a hot, humid day, one of Chicago's famous August dog days. "We should be there in just a minute, George." "It was terrific of Susan to invite us to stay with her," George said. Susan Ling had gone to high school with Nancy and George and was now an assistant on the "Marcy!" show. "We don't even know how long we'll have to stay." "Just until we find out who's been sending Marcy threatening messages. Maybe we'll get lucky and solve the case very quickly," Nancy said. The girls had reached the heart of downtown Chicago, known as the Loop. Nancy could see the grand old facade of the Wrigley Building as they crossed under the elevated train tracks. Off to her left was the Sears Tower, the tallest building in the world. Nancy scanned the office buildings as they made their way to Lake Shore Drive, with its magnificent view of Lake Michigan. "Here's the Media Center," she said finally. "And there's Susan!" George said. "She's standing by the entrance." Nancy pulled her blue Mustang up to the curb and tooted the horn. A slender, dark haired girl carrying a large white envelope turned around, a questioning look in her pretty brown eyes. Seeing Nancy and George, she hurried over to the car, smiling warmly. "You're right on time," she said. "Just leave the car here. I'll call a valet to park it." "A valet?" Nancy asked, surprised. She shut off the engine. "This is real VIP treatment," George said, climbing out and joining Nancy on the side walk. "Well, you're Very Important People to me," Susan said with a laugh. "Besides, I'm the one who's responsible for the show's parking arrangements. It's part of my job as a general gofer. You know, go fer this, go fer that." "Well, it's great having friends in high places," Nancy quipped, and handed her car keys to the valet who appeared at Susan's wave as they approached the lobby. Once they were inside, Nancy looked up. The soaring vaulted ceiling made the center seem immense. Twenty-foot silk flags, hung from high up, announced coming events at the center. "These girls are with me," Susan told the balding, freckled security guard. "They're guests of Marcy Robbins." With a smile, he handed Nancy a pen for her to sign in. "Are you going to see the show?" he asked, pointing to a set of double doors marked Studio A -- "Marcy!" A laminated silhouette of a wavy-haired young woman holding a microphone was prominently displayed next to the doors. "I'm taking them to the offices first," Susan answered for Nancy and George. "They'll get to the set from backstage." "Okay," the guard said, giving Nancy and George two stiff cardboard passes. "You'll need these in that case. "The audience members get tickets," Susan explained. "These passes are for the offices." Susan led Nancy and George through a cordoned-off part of the lobby beyond the elevator banks. "Too bad Bess isn't here," Susan said. "She'd love the topic of today's show -- 'Is calendar modeling sexist?' And we've got male calendar models as guests." "Bess will definitely watch at home," George assured Susan with a grin. Nancy pointed to the envelope Susan was carrying. "Is that a calendar?" she asked. "No," Susan said. "This is Marcy's new publicity shot. Want to see it?" She stopped just long enough to open the envelope and pull out an 11-by-14 color photo. The photo was of a petite, freckled-faced Marcy Robbins standing in front of a studio audience wearing a houndstooth-check jumper with a white blouse and bright green tie. Marcy's expression communicated both intelligence and lively fun. "What a great photo," Nancy said. "And she looks so young. If Bess hadn't told me she was twenty-six, I'd have thought Marcy was no more than eighteen." Susan smiled. "Marcy hasn't seen the photo yet. I just picked it up for her, and now I have to drop it off at her office." "Great!" George said brightly. "That means we can see her office." Susan led them through a set of double doors marked Stern Productions at the back of the lobby. "This is where we work," she said, pulling the door open. The first thing Nancy and George saw was the receptionist, a blond woman seated behind an enormous glass and chrome desk. "Hi, Ginger." Susan waved to the woman. "These are old friends from high school, Nancy and George." Susan breezed through the reception area and pushed through another door. "Marcy's office is right back here," she said, leading Nancy and George down the hall, into a large white office decorated with furniture in vivid primary colors. "This is fabulous," Nancy remarked, taking in all the photos of celebrities and the framed awards that lined the walls. "Marcy has great taste," Susan agreed. "Hi!" called a male voice. A slender guy of about twenty-five with brown hair popped out from beside a file cabinet in the corner of the office. His yellow shirt emphasized his pale skin and small, light-colored eyes. He had a walkie-talkie in a special holster on his belt. "Jack!" Susan said, sounding surprised. "What are you doing here?" "Marcy wanted a back issue of Teen Talk to use as a prop," he said, holding out a rolled-up magazine in one hand. "When she was writing for the magazine, she did an article about one of the models on today's show." "Guys, this is Jack Cole, our production stage manager," Susan told the girls. "Hi," Nancy said, offering her hand. Jack didn't respond, though. He was staring past Nancy at the doorway, his eyes round with surprise. Nancy spun around. In the doorway stood a petite young woman with a scrubbed, freckled face. Her hair was in curlers, and a clear plastic cape hung from her shoulders. For a split second Nancy didn't recognize the famous Marcy Robbins. "Jack. I'm waiting," Marcy said with slight impatience. Her normal bubbliness was missing. "Yes, Queen Marcy," Jack replied with a joking grin, handing her the magazine. "I've been busy getting the other props milady requested. Give me a break, okay?" "Sorry," Marcy replied wearily, turning to Susan. "Meet me in my dressing room, Susan," she said, heading up the corridor. "I'm out of here, too," Jack said, pulling on his work gloves. "See you," Susan said with a quick wave as he left the office. Then she turned to Nancy and George. "I'll introduce you to Marcy now." When they got to Marcy's dressing room Nancy was surprised at how small it was. Bright track lighting made it warm and friendly, and cards from well-wishers filled a bulletin board on one wall. On another wall stood a long rack filled with clothing. The other two walls were all mirrors. In the center of the room, Marcy sat in a beautician's chair, her eyes squeezed shut and a copy of Teen Talk on her lap. Behind her, a dark-haired, middle-aged woman in a pink smock yanked rollers from Marcy's hair. "Hey, take it easy, Dee," the talk show host said, wincing. "And keep it simple today. Forget the barrettes." Nancy knew something was bothering Marcy Robbins. Marcy looked up at Susan, Nancy, and George just then. "Oh, hi," she said as if seeing them for the first time. "Sorry, it's crazy today. But then, it's crazy every day." 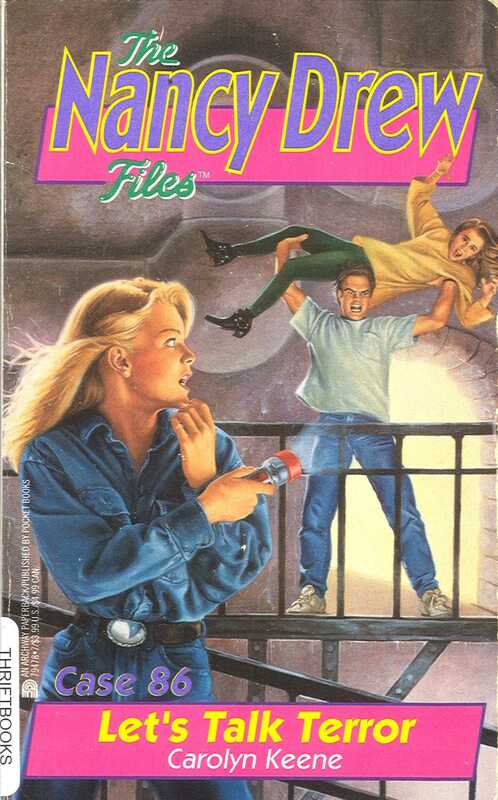 "Marcy, this is George Fayne and Nancy Drew, my friends from River Heights," Susan told her. Marcy's eyes lit briefly on George, then fixed on Nancy. "Thanks for coming, both of you," she said. Scrunching her face and peering in the mirror, she suddenly jerked her head around. "That's enough. Thanks, Dee. Tell Midge I'm ready for makeup." "You could use more combing out," Dee argued, though Marcy's hairdo looked perfect to Nancy. "That's okay. It's only hair," Marcy said, dismissing Dee. When the hairdresser left the room, Marcy leaned forward. "I didn't want to say anything in front of Dee. Susan has told me all about the investigating you've done, and I was really impressed." She bit her lip and went on. "This show means everything to me, and I couldn't bear to lose it. Not this way, anyhow. I know I've made a few waves, but I believe in making waves. I want to help people communicate better. That's what 'Marcy!' is all about. I was prepared for some people not to like me. But threats?" Marcy tilted her head and blew out a deep breath. "How many threats have you received?" Nancy asked gently. "Just two," Marcy replied. "They were slightly garbled messages on my voice mail telling me to quit the show or else." "Can we hear them?" Nancy asked. "Sorry," Marcy said with a regretful shrug. "I erased them immediately. The last thing I need around me right now is negative energy." "What could you tell from the voices?" George asked. "Were they male or female?" "I couldn't tell," Marcy replied. "They were disguised with some sort of electronic distortion. The sound was scary." She pounded her fist on the arm of the chair. "Just when every thing was going so well, too!" "Does anyone else know about the threats?" Nancy asked. Marcy shook her head. "Just Susan and you two." Marcy quickly changed the subject, as if she were anxious to push the threats out of her mind. "By the way, Susan, did you pick up my new publicity shot?" "I put it on your desk," Susan said. Marcy glanced at the clock on the wall. "I still have time to look at it," she said. "Go get it, okay?" Marcy turned to Nancy and George and explained, "The Tribune is doing a two-page spread on me, and they need the new shot today. I can't wait to see it." "Here it is," Susan said, waving the envelope as she hurried back into the room. Smiling, Marcy reached for the envelope and opened it. Her smile vanished as she withdrew her empty hand and peered inside. "What is it?" Nancy asked, reacting to the expression on Marcy's face. "I'm not sure," Marcy murmured, turning the envelope upside down and giving it a shake. Torn pieces of paper fell onto the magazine on her lap. Someone had just ripped Marcy Robbins's brand-new publicity photo to shreds!